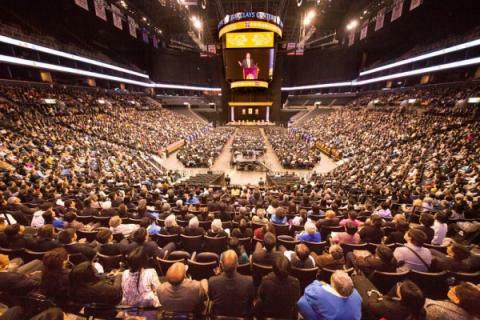 Nearly 10,000 practitioners from 53 countries attended the New York Falun Dafa Experience Sharing Conference on May 15. Mr. Li Hongzhi, the founder of Falun Gong was warmly welcomed. He lectured and answered questions for over two hours. 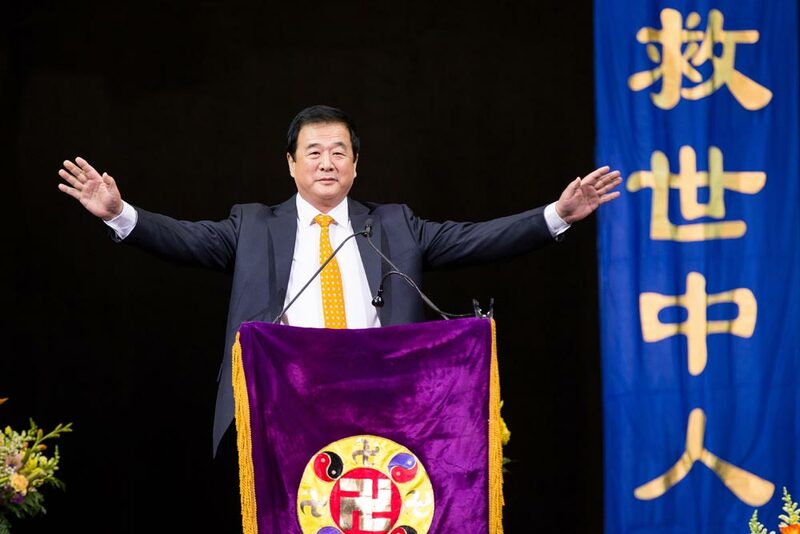 Mr. Li Hongzhi encouraged Falun Gong practitioners to cultivate more diligently and take seriously their responsibilities; to do better in saving sentient beings and clarifying the truth, and in personal cultivation. A dozen Falun Gong practitioners shared their cultivation experiences on stage, showing their gratitude to Master Li. Although they were from different countries, social strata and fields, they had cooperated in clarifying the truth, overcome difficulties and improved their Xinxing. Xie Tian, a business professor at the University of South Carolina Aiken had found out about Qigong and spirituality as a graduate student in Beijing in 1980. For him, the atheism of the CCP had always felt untenable. “But where is God?” “What is the truth?” He began to explore these questions. In his first 10 years of living in the U.S., he had visited many churches, temples and communities, to search for the way to God. After reading Zhuan Falun, Xie Tian immediately felt that he had understood the truth and would certainly practice Falun Dafa. However, he was busy as a MBA student who was preparing for a successful career. But when the CCP began repressing Falun Gong in 1999, Xie Tian realized that he should start cultivating immediately. As a professor, he clarified the truth about Falun Gong in presentations to students, both directly and indirectly, from the viewpoints of economy, commercialism, human rights, and social aspects. In 2014, Xie Tian was promoted to be a tenured professor. The process went smoothly. In addition to his normal teaching and research work, he prepared application documents, published a book about the truth behind the Chinese economy, gave presentations, participated in compiling a newspaper and magazine, and joined Shen Yun promotion—it was incredible how much could be achieved! Nothing was delayed. He truly felt that Falun Dafa was extraordinary and wonderful. Ms. Mei (a pseudonym) from the U.S. was born into a privileged family. She told a story about her father, who had gone from misunderstanding Falun Gong to being a big supporter. Due to the poison of the CCP’s lies, the relationship between Mei and her father had become very tense for a while. With her cultivation improvement, their relationship also gradually improved. That experience completely changed her father’s attitude towards Dafa. He felt that his daughter, as a Dafa practitioner, had become very respectful. He now says Falun Dafa is good. Chen Wen, a biologist from the California Institute of Technology, has given dozens of presentations to promote Shen Yun to organizations in mainstream society. She has witnessed people’s enthusiasm towards Shen Yun and traditional Chinese culture. In 2016, Shen Yun had 31 sell-out shows in Los Angeles, with more than 70,000 audience members. Tickets sold like gold dust for 28 of the performances. Although Shen Yun didn’t need Chen Wen’s presentations to sell, more and more communities did need presentations about human rights in China. So she began systematically clarifying the truth about Falun Gong, organ harvesting, communist infiltration into Western society, quitting the CCP and the lawsuit against Jiang Zemin. Chen has two kids and a full time job. She gets up at 3am every morning to practice the exercises and study Zhuan Falun.. Then she prepares breakfast and lunch for the kids at 6:30am. About 7:15am, she sends them to school, and then goes to work. After dinner, she studies Fa with her kids and does Dafa projects until 10pm. Chen says her practice has improved her work efficiency and has given her more flexible time every day. Wang Lijing from Italy began to practice in 2008. The CCP’s inhumane persecution made her shudder. She decided to make phone calls to China to ease the pain of imprisoned mainland Chinese practitioners. She felt invisible pressure at the beginning. With the help of fellow practitioners, she realized that she needed legal knowledge to tell the people in China’s public security departments that the persecution of Falun Gong was illegal; that their law enforcement was in fact breaking the law. She told a story about killing a donkey the moment it leaves the millstone to indicate that the CCP couldn’t run away on reckoning day. They should cherish this time to expiate their guilt. According to incomplete statistics from the Minghui website, 3,995 Falun Gong practitioners have been persecuted to death by the CCP since July 20, 1999. This figure is only the tip of the iceberg. Until now, no legal documents have ever identified Falun Gong as being a cult, even in China. In recent years, senior officials who have been involved in the persecution of Falun Gong, such as Zhou Yongkang, Bo Xilai, and Li Dongsheng, have all been arrested. The authorities under Xi Jinping have energetically punished the political and legal teams. The public has said that this was retribution for those evil CCP officials. Wang Lijing said that the police had also been poisoned with lies, so she treated them with compassion when clarifying the truth. This had a very good effect. She shared that most police officers listened to her talk from the beginning to the end quietly. A lot of people, including the political secretary of the CCP had quit the CCP after understanding the truth. Pan Shuzhen from Switzerland has been clarifying the truth face to face to Chinese people at a tourist spot for more than a decade. She was there every day, except weekends, regardless of wind or rain. Each day, she met different people; some were ignorant, some abusive, and others accepted the truth and praised Falun Gong. She improved herself by thinking of others. More and more people did the three withdrawals from CCP. She helped more than 14,000 people quit the CCP and its affiliated organizations in 2015 alone. In fact, before the persecution started in 1999, the whole society had accepted Falun Gong. You could hear people everywhere saying, “Falun Dafa is good! Truthfulness, Compassion and Forbearance are good!” The CCP’s investigation has also confirmed this. The China State General Administration of Sports conducted a comprehensive investigation into Falun Gong in May 1998. The results showed that 97.9% of practitioners had experienced improvements in their physical health. One time, Pan Shuzhen tried to give a truth clarification leaflet to a man from northeast China, but he attacked Falun Gong immediately. She said, “Master has helped so many paralyzed patients recover and walk normally and many incurable patients in hospital have also become absolutely normal.” Bystanders listened attentively; some nodded, and no one left. Some who were listening asked for truth clarification materials. Others asked her to continue talking. “Master has spread Falun Dafa to more than 100 countries, giving benefits to countless people. They all say that Falun Dafa is good. However, the evil Communist Party members are persecuting Falun Gong and imprisoning practitioners. They even harvest the organs from living Falun Gong practitioners for profit. The heavens are watching people’s actions. Good will always be rewarded and evil must face retribution,” she told the tourists. Pan Shuzhen asked the tourists to stay safe by quitting the CCP. More than 30 people did the three withdrawals from CCP on the spot. The Epoch Times published the editorial series, “Nine Commentaries on the Communist Party” in November, 2004. It deeply exposed the evil nature of the CCP and triggered a tide of “three withdrawals”—to quit the CCP and its affiliated organizations. In 2005, volunteers formally established The Global Service Center to Quit the Chinese Communist Party. To date, more than 230 million people have withdrawn from the CCP and its affiliates. Ghazal Tavanaei from Iran began practicing Falun Gong with her father, when she was 18 years old. Every year, about 350,000 Chinese tourists visit her hometown, Dubai City. She goes to China Town to distribute truth clarification materials to help Chinese people quit the CCP. “As long as I try to go forward, all problems can be solved,” Ghazal said. During the summer of 2015, Ghazal joined the “Ride2Freedom” campaign with 25 youth from 15 different countries. They cycled across the U.S. to call attention to the persecution of Falun Gong and help Chinese children who were orphaned through the persecution. The event received a lot of support from politicians and entrepreneurs, as well as media coverage. On the way, the team clarified the truth to people of all kinds, from easterners to westerners, from government officials to street beggars. Ghazal was deeply touched by the cooperation, encouragement and teamwork during the bicycle trip. This year’s Fa conference was part of the 17th anniversary celebration for “5‧13 World Falun Dafa Day”. This year it became the biggest Falun Dafa activity to take place overseas. Around 10,000 Falun Dafa practitioners gathered in New York for group exercises, cultural performances, rallies and a parade, astonishing people in Manhattan. Falun Dafa (also called Falun Gong) is an advanced self-cultivation practice of the Buddha school, founded by Mr. Li Hongzhi. It was first introduced by Master Li in Changchun, China on May 13, 1992. It is a discipline in which “assimilation to the highest qualities of the universe—Zhen, Shan, Ren (Truthfulness, Compassion, Forbearance)—is the foundation of practice.” Currently, it is practiced in more than 100 countries. The main text, Zhuan Falun by Mr. Li Hongzhi has been translated into more than 40 languages. Falun Dafa is well known to have quickly improved people’s minds and moral characters, and given amazing health benefits to over 100-million practitioners worldwide.